This document was part of the Multicultural Philanthropy Project, funded by the W.K. Kellogg Foundation. A series of fourteen guides examine the ways in which various gender, ethnic, cultural, religious and racial groups use their gifts of time, money, and talent. They reflect the ways giving and voluntarism are embedded in American life and challenge the notion that philanthropy is the exclusive province of elites. The guides include discussion topics, research questions, and literature overviews with annotated bibliographies. They were developed both to integrate the study of philanthropy into the curricula at colleges and universities, and to provide a tool to nonprofit professionals in the area of development and fundraising. Each volume provides background information on a selected community that will help practitioners work effectively with these groups. This guide documents the various ways in which blacks have practiced self-help starting with the formation in 1785 of the Free African Society, the first of many mutual aid societies established by free blacks in the United States. 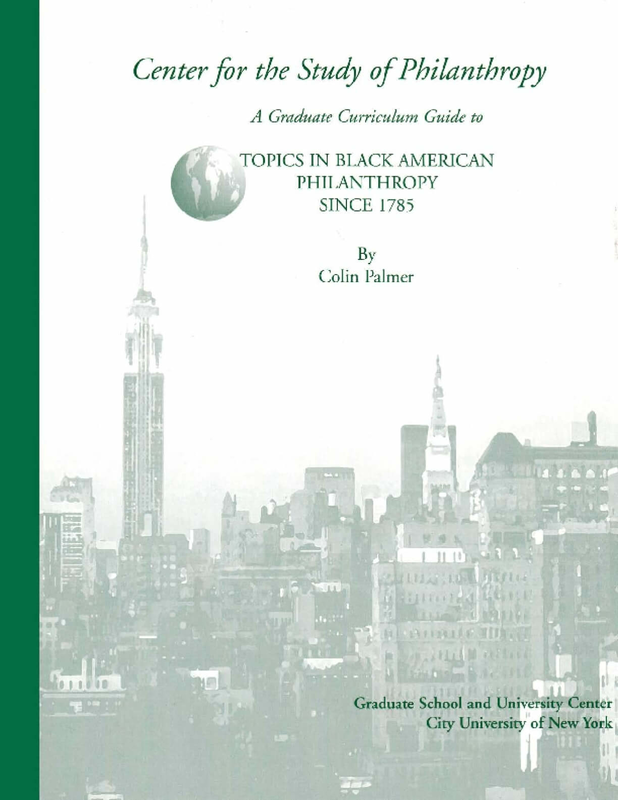 The author emphasizes the organizations and individuals who were significant to efforts to improve the black condition, while also analyzing the ideology that legitimized various philanthropic exercises. He considers both the successes and the failures and includes a look at those who sought to "redeem" Africa and Africans. The guide will be of particular use to those seeking to understand the long tradition of black philanthropy, self-help and other organizations, and how the history of these organizations reflects the struggles of a people to create and realize themselves. Information on key African American individuals and organizations is readily accessible. The guide may be used to identify sound building blocks for developing strategies for culturally sensitive and historically appropriate fundraising appeals. Copyright 1998 Center on Philanthropy and Civil Society at the Graduate Center of the City University of New York.